I have a project at school where we are making a plugin of our own choosing. I want to make a MIDI-FX plugin to use in Logic, but I don't know how to make Logic know it's a MIDI-fx and not channel strip plugin or instrument. I have tried searching around, but couldn't find anything on this. I've understood i need the -Q flag to output realtime MIDI, but again, can't find anything on how to install this to Logic as a MIDI-FX plugin. I see that a MIDI-fx plugin I downloaded was installed under Library/Audio/Plug-ins/Components as .component file, but there are both instruments, channel strip plugins and MIDI-FX plugins here. Hmm, I think this info is hard coded into the binary, or else it's added to the plist.info file that ships inside the bundle. I'll take a look tomorrow. just took a look there, it seems that the plugin type needs to be set to aumi, which is something that needs to be done when the binaries are being built. Therefore it's not something you can achieve as an end user. 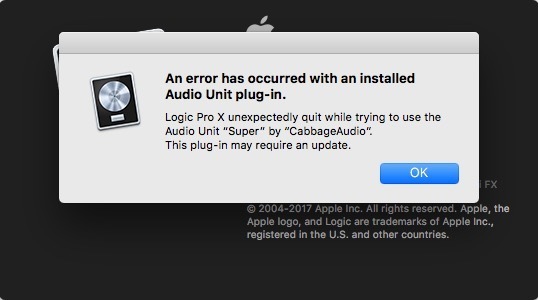 I can try building a version tomorrow that will export as this type, but it seems only a small number of hosts support this plugin format, Logic Pro being one of the main supporters. I don't have Logic, so I may need your help testing it. Can you try this one and let me know? I've added a new export option that will let you export MIDI Effect AudioUnits. Hopefully Logic will recognise them as the correct plugin format. For more info on how to create MIDI effect check this thread. It seems as the link takes me to a url with the filename instead of downloading, and gives me an error that the browser can't resolve the IP-adress. Tried using both Chrome and Safari. It's the most recent OSX zip from 14.45 today. Thanks for checking it. I'll take a look tomorrow. Maybe the auval tool can be of some help to me. I didn't think to try it today when I was making the changes. And see what it reports about your plugin?